Blue Crabs will race on Sunday, September 3rd at the 70th Annual National Hard Crab Derby at Somers Cove Marina in Crisfield, MD. Before I lived 6 miles from Crisfield, I knew about the National Hard Crab Derby. People from all over the Mid Atlantic region flock to the Crab Capital of the World to see some 400 crabs compete in the Governor’s Cup Crab Race every Labor Day weekend. The crab race is only a part of the fun. There’s the boat docking contest with a sizable purse, carnival rides, games, crab-picking contest, concerts in the evening, fireworks and a parade down Main Street where the newly crowned Miss Crustacean waves to on-lookers. The 66th Annual National Hard Crab Derby will be held Labor Day weekend, starting Thursday, August 29th through Sunday, September 1st. 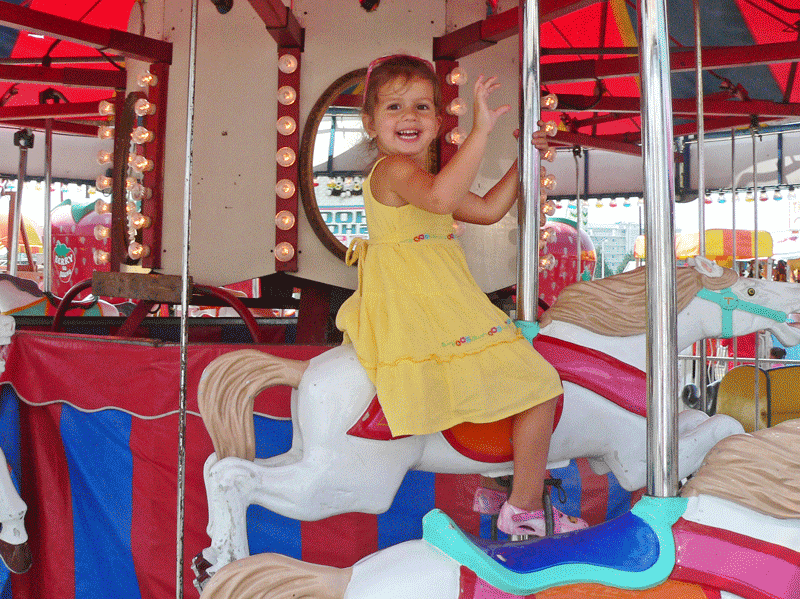 Thursday night – Miss Crustacean Pageant, Carnival Night- Kids wristbands $20 – ride free all night. Saturday – Crab races including the Governor’s Cup, rides, games, food. $3 admission. Gates open at noon. 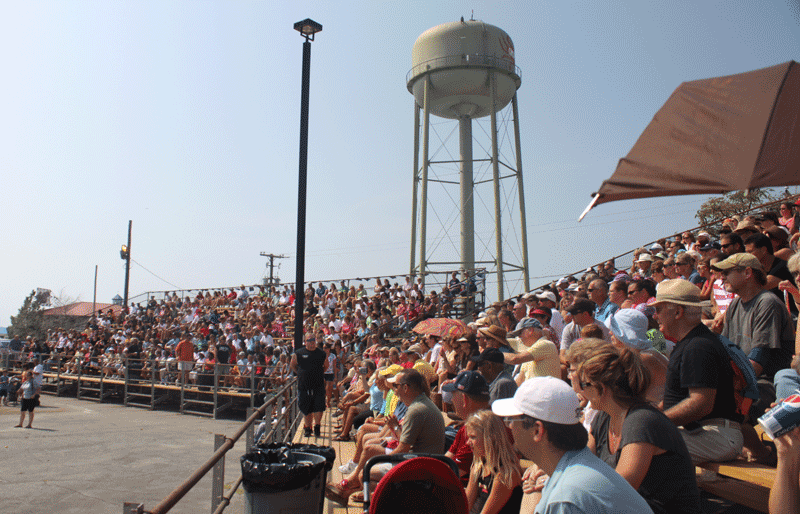 Sunday – Boat Docking Contest / Fireworks – Gates open at 10:30. Boat Docking Contest begins at 1:00 pm. Check the Crisfield Chamber of Commerce website for a Schedule of Events. Imagine sitting with a thousand people in stadium bleachers looking down at a stage. In front of that stage is a large wooden platform pitched at a slight angle. 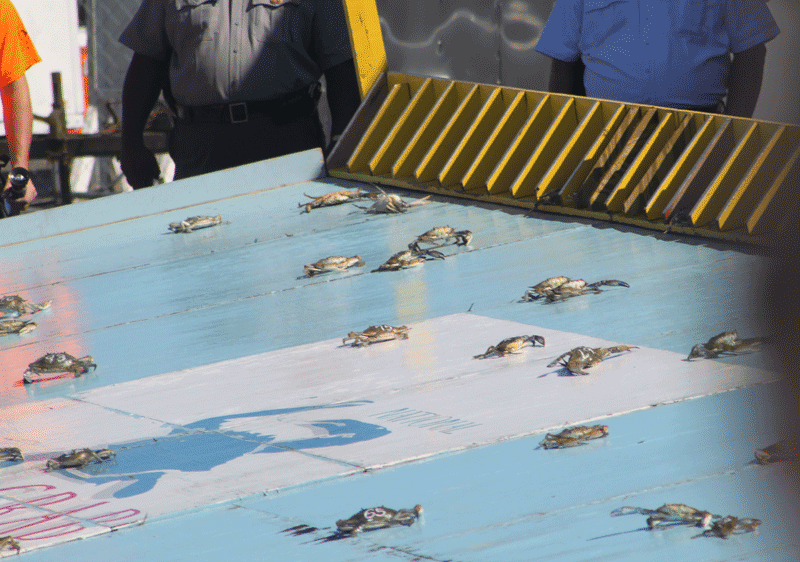 At the top of the platform is a holding area with separate compartments for 50 crabs. All crabs are numbered and registered with a unique name given by its owner. At the start of the race, each crab is announced by name, number, and owner, then placed into one of the 50 compartments. The crabs are lined up like horses at a starting gate. The race starts when the compartmentalized crab-holding area is flipped over and the gated crabs are set free onto the platform …. and encouraged (by a screaming crowd) to be the first crab off the platform. The first crab that scooches its off that platform onto the asphalt is the winner of that heat. And there are lots of heats. The race concludes with all the winners of the previous heats clawing (hee hee) their way to the edge of the platform. One strong, perfect blue crab is dubbed that year’s winner of the Hard Crab Derby. The Governor’s cup race is a separate race named for Crisfield’s native son, J. Millard Tawes – 54th governor of Maryland and the only person Maryland’s history to occupy all three offices of the Board of Public Works – Governor, Treasurer, and Comptroller. Miss Crustacean presents the trophy to the owners of the winning crabs. You “foreigners to the shore” – meaning that you’re not born here and didn’t come here to live – shouldn’t giggle about the title “Miss Crustacean” Funny as it may sound to outsiders, the title means something in Somerset County, MD. It’s a descriptive tag that follows a woman for the rest of her life. To have the Miss Crustacean title in your resume of life is something. You hear it all the time …. “Oh, you know Val, down to the Chamber – hard worker, sweet girl, was in the Crisfield Choir? She’s a former Miss Crustacean.” It is a title that is coveted and generates pride in the whole family. I was once introduced to Maryland’s Adjutant General of the National Guard – Major General James Adkins. We started the small talk, you know – what do you do for the State – I work in economic development. He’s from Cambridge. He asked me where I was from. I said Howard County but I currently live in Somerset County. Then the small talk stopped. General Adkins said, “I’m married to a former Miss Crustacean.” <— I kid you not. Different as the traditions in this town might seem – racing crabs, picking crabs and crowning Miss Crustacean, I love Crisfield. Though it has some shabby parts, tough economic times and most recently the devastation from Hurricane Sandy last year, the town has a heart – which is its people – people who continually push the town in an upward direction and move forward together despite the challenges they face. 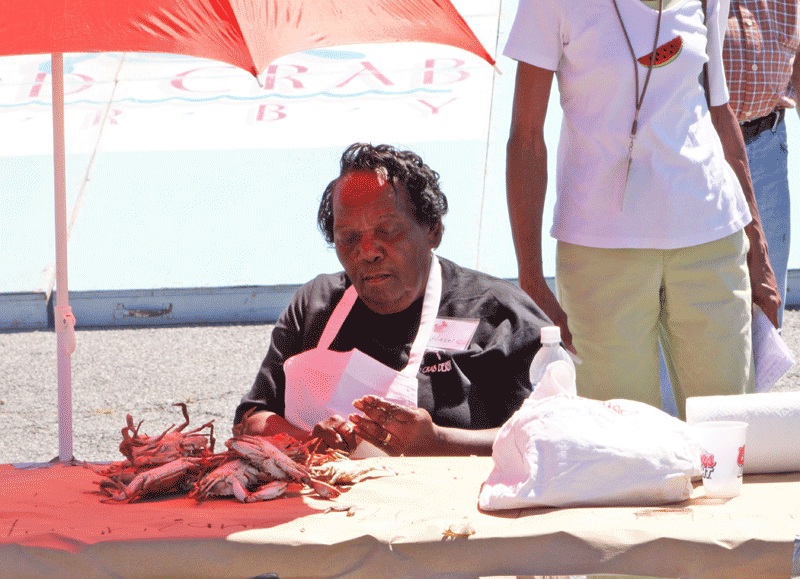 The National Hard Crab Derby, attracts 5 times the town’s population and has a boat docking purse that exceeds the estimated local household income. This is a great testimony to the people of Crisfield who put on this event, and a prime example of how remarkably talented people working together can accomplish what larger towns with higher incomes and greater resources have difficulty pulling off. “Hurricane Hazel” Cropper is a legend in Crisfield as a champion crab picker. Crisfield has one of the most undiluted cultures on the east coast. 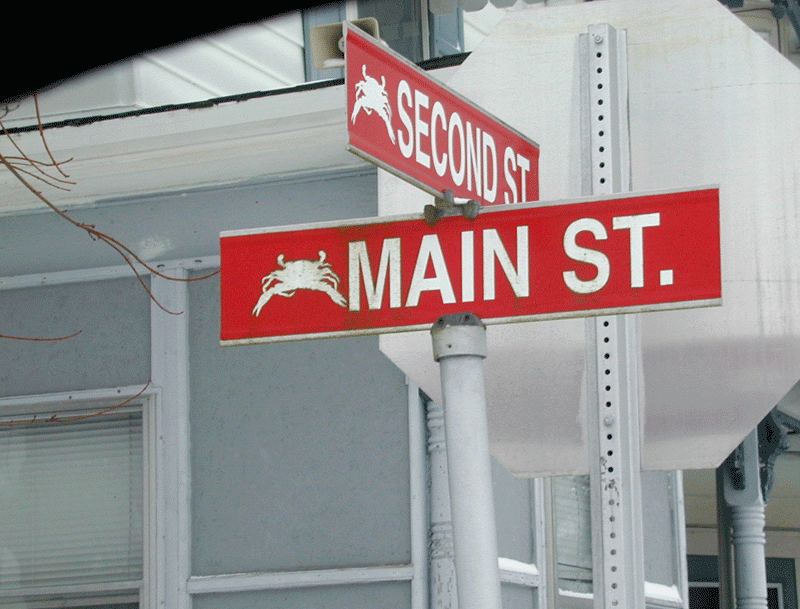 Many inhabitants who live in Maryland’s southernmost town can trace their roots back 10 to 14 generations. The waterman’s culture still hangs thick around the commercial and residential districts that reflect a time when watermen shared yarns in dilapidated shanties and locals could walk to the docks and seafood processing plants to earn their wages. The experience of interacting with these local people, hearing their stories, enjoying their fabulous food and sharing in their local celebrations is a cultural experience worth having. And this festival – the Hard Crab Derby – shares that sense of celebration with nearly 10,000 visitors. At the turn of the 20th century, Crisfield was a huge port of call on the Chesapeake Bay and was second only to Baltimore for trade commerce in the state of Maryland. The railroad came straight down to the town dock and picked up carloads of seafood brought into the port of Crisfield, and produce from local farms. Today that dock is still referred to by locals as “the depot” and it is one of the largest waterfront public places in Maryland affording visitors and locals a place to walk, fish, sit awhile, share an ice-cream cone, watch the boats come and go from Somers Cove Marina (the largest state-owned Marina in Maryland), see the waterman bring in that afternoon’s catch, see the herons and other waterfowl sail over Janes Island, or watch a spectacular Tangier Sound sunset from the 2nd level viewing area. 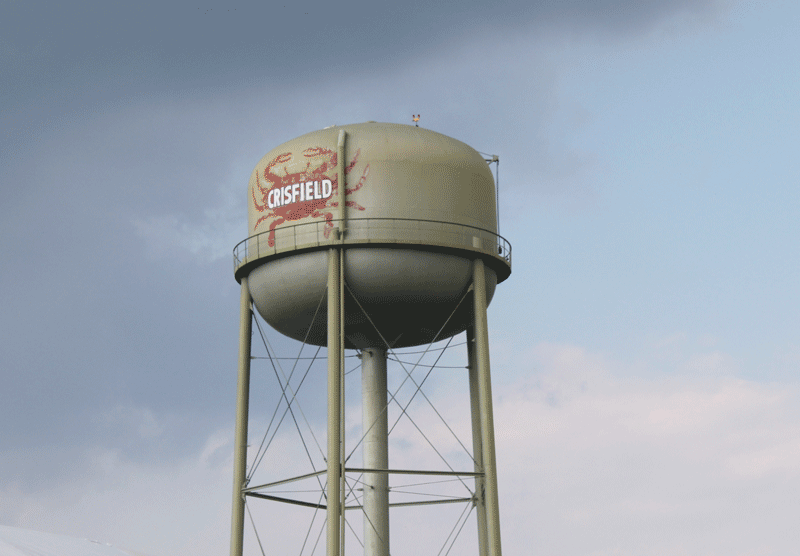 Crisfield became known for its seafood – emphasizing the Chesapeake Bay blue crab. The waterfront was dotted with seafood processing plants and though crabs are far more scarce in the Bay than they were in 1930, the Crisfield harbor is still awash with watermen during the crab and oystering season. The town dubbed itself the Crab Capital of the World, and its crustacean insignia is everywhere – blazoned on two water towers, every street sign and most recently – a wind turbine. Businesses like Eddie Heath’s Crab Pots and Crustacean Station straddle “the strip” which is the main drag running straight to the depot. As one walks or slowly drives along that strip, water views peep in and out through the store fronts, the crab shedding plant, the restaurants, and the condominiums. Other activities around town include the J. Millard Tawes Historical Museum, a general history museum of the area including maritime artifacts, and collections that relate to the history of the City of Crisfield and the life of Maryland watermen. Ask at the museum about the Crisfield walking tour or the tour of the Ward Brothers Workshop. Drive out (or bike out) to Janes Island State Park and walk some of the wooded trails, or kayak down to a private beach. Stretch out on Wellington Beach, Crisfield’s own beach with public access. There are many restaurants in the town, most featuring seafood. Charter fishing boat trips are available, as are excursions to Smith and Tangier Islands. More visitor information can be found at the Crisfield Chamber of Commerce website or the Crab Capital website. 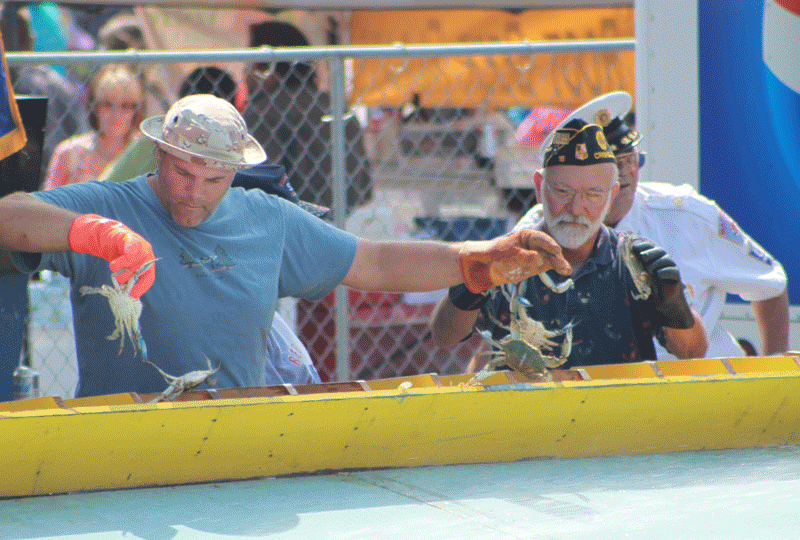 BLUE CRABS – FOOD – FAMILY FUN – Hard Crab Derby is a fixture in our Labor Day weekend every year. I wouldn’t think of being anywhere else. Our kids and grandkids are developing their own memories of Somerset County Labor Days, and the Derby race is something they talk about all year. We always have a houseful on Crab Derby weekend. Summer memories that stick are made at the Crab Derby. It’s a festival you feel with all five of your senses.